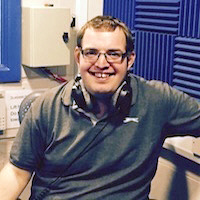 My name is Chris Green and I am currently the Head of Music and Output which means I’m in charge of picking the songs for the weekly music playlists and making sure the sound of the station is running smoothly. My Dad has been a member of Radio Hillingdon since 1977, so in November 1986 when I arrived on this earth I was born into Radio Hillingdon, and in 2006 I officially became a member of the station. What I enjoy about being a member is putting Smiles on Patients faces and you can hear me when any of the regular presenters have time off, as I tend to cover their programmes. My favourite food is Steak and Chips, or possibly a good Chippy Tea and my favourite colour is Red (Team Colours of Manchester United). When not working for Radio Hillingdon I work in the kitchens of a fast food outlet. If I won a million pounds I would probably buy a big house just for me!